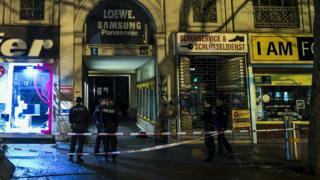 Police in Austria say a 23-year-old man has admitted carrying out knife attacks in Vienna which left four people seriously injured on Wednesday evening. The man, an Afghan national, has denied a political motive for the attacks. Three members of the same family were hurt in the first attack at Nestroyplatz at 19:45 (18:45 GMT) and an unrelated man, 20, was stabbed nearby around half an hour later. The suspect reportedly told police he had been in a "bad, aggressive mood". The 23-year-old said he had attacked the family - parents and a teenage daughter - because he was angry about his situation in life, Vienna police said in a statement (in German). He said he had attacked the 20-year-old man, an acquaintance, because he held him responsible for his past drug addiction, the police added. The fourth victim is a fellow Afghan national, local media report. Earlier reports had said he was from Chechnya. The father of the family, who is 67, remains in a critical condition in hospital. The lives of the mother, 56, and 17-year-old daughter, as well as the 20-year-old unrelated victim, are now out of danger. The suspect categorically denied a political motivation when questioned, police said.